LAS VEGAS — Washington Wizards rookie Troy Brown grew up in a home where food and clothing were never an issue with two educated, successful and loving parents. Such was not the case for some of Brown’s Centennial High School classmates who were homeless. So, to help homeless teens and the less fortunate in his hometown, Brown recently gave away a significant amount of basketball gear that he had accumulated over six years. “I don’t need this stuff. This is stuff that people actually need and can wear, especially being from Vegas, where we have homeless high school kids,” Brown told The Undefeated. “That is a big problem right now. When I was going through my stuff, I was thinking, ‘Am I going to wear this or does someone else need this?’ I was basically throwing most of it in the ‘I don’t need this’ pile and keeping the little stuff. According to the Las Vegas Review-Journal, the homeless census estimated that 6,490 people in the Las Vegas area were either living in shelters or on the streets. An estimated 20 percent of the homeless were teenagers. One charitable nonprofit organization that aids homeless teens that Brown supports is Project 150. According to its website, Project 150 was established in 2011 when the founders learned in a local newspaper story that Rancho High School had about 150 homeless high school students in need during Christmas break. Project 150 currently serves more than 3,300 registered homeless and 3,100 non-registered. “High School is Tough Enough” is Project 150’s slogan. Brown toured the Project 150 donation center July 26 with Pulido. Brown was moved by some of the homeless teens who volunteered to work there to earn credits for extra clothing, food and supplies. 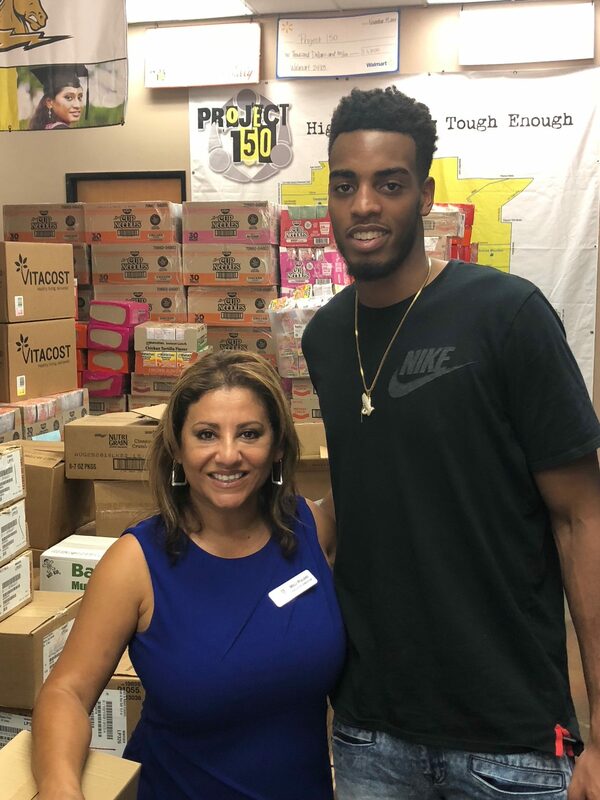 Troy Brown with Project 150 Executive Director Meli Puido. Brown was born and bred in Las Vegas and became a high school basketball standout at Centennial. He played in the esteemed 2017 McDonald’s All-American Boys Game, Jordan Brand Classic and Hoop Summit as a senior. From the eighth grade through his freshman season at the University of Oregon, he accumulated a large amount of basketball gear that included shoes, shirts, jerseys and sneakers. The 6-foot-7, 215-pounder kept most of the clothing and shoes he received from school and AAU teams in closets, boxes and in the garage at his parents’ home and at school at Oregon. Brown said all of his donated basketball gear filled up 16 trash bags with clothing and four boxes with sneakers. There were shirts and shorts ranging in size from medium to XL and primarily basketball shoes, sizes 13 and 14. Half of Brown’s donated clothing and shoes were given to the Dr. William U. Pearson Community Center in Las Vegas, which serves low-income individuals and families. The other half was donated to Project 150. Brown also donated clothing to Pearson Community Center earlier this year. “When we brought in all the stuff, [Pulido] was like, ‘Oh, wow, we need this,’ ” Brown said. “It is a donation center. They get stuff all the time. They have a lot of women’s clothing. You got to the area with the clothes and it’s mostly women’s. The men’s section is just a little section in the back. A lot of dudes don’t donate clothes. Brown said he felt “a lot better about myself” after making the clothing and shoes donation, and he encourages others to do the same. Pulido said Brown also donated some jeans and dress shoes. She was excited to add some clothes from Brown that were hip to today’s clothing styles. She also believes that the recipients will be proud to wear old clothes from an NBA player from their city. Brown averaged 11.3 points, 6.2 rebounds, 3.2 assists and 1.6 steals per game for Oregon as a true freshman last season. He didn’t receive an invite to the green room at the 2018 NBA draft. So instead, Brown decided to have a draft party with family and friends in Las Vegas at a private bowling alley at the Red Rock Casino Resort & Spa. Brown said he was motivated by the green room snub. Brown said he was not stressed at the start of the draft since he assumed he would be selected after the 10th pick. The team with the highest pick that he had worked out for was the Charlotte Hornets, who had the 11th overall selection. Brown finally got the phone call he dreamed of when the Wizards called to say they selected him with the 15th pick. Brown had conversations with Wizards president Ernie Grunfeld and head coach Scott Brooks during the call. Brown was the highest player taken to not attend the draft and was very excited to see the announcement of his selection on television. Brown was well-supported during NBA summer league, with many of his family members and friends attending his games. After getting his jitters out during warm-ups, he had 13 points on 6-of-13 shooting from the field, 4 rebounds, 1 assist and 1 steal in his summer league debut against the Cleveland Cavaliers. Brown averaged 18.4 points, 6.8 rebounds and 2 assists per game in summer league. Brown described himself as a “basketball player” when asked his position. Based on his summer play, expect the Wizards to get this basketball player on the floor during his rookie season. “I just want to be able to contribute my rookie year, do the little things, earn my minutes and get on the court,” Brown said. Living in the nation’s capital of Washington, D.C., as a member of the Wizards could be a great fit on and off the court for Brown, who is passionate about basketball and helping out the less fortunate.